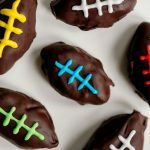 Win your Big Game party with this fun Game Day Spirit Cookie Footballs recipe. Made with OREO Cookies and cream cheese dipped in chocolate, they are easy to make ahead of time to reduce party prep stress! Shape into 48 (1-inch) football shapes. Freeze 10 min. Cover rimmed baking sheet with waxed paper. Dip cream cheese footballs, 1 at a time, into melted chocolate, turning to evenly coat all sides of each football with chocolate; place on prepared baking sheet. Use icings to draw laces on footballs. Refrigerate 1 hour or until chocolate is firm. Store in tightly covered container in refrigerator. Melt 1 oz. of EACH of several different colors of candy coating wafers as directed on package. Use instead of the decorating icings to pipe the laces onto the footballs. Substitute 1/4 cup white decorating icing for the colored icings. Use to draw the laces on the footballs. Add sprinkles or nonpareils in the colors of the two football teams playing in the big game. Make it Simple: Instead of shaping the cream cheese mixture into football shapes, roll it into 48 (1-inch) balls. Decorate with sprinkles or icings as desired. Substitutions: Substitute 1 cup peanut butter for the softened cream cheese.